The dollar, having risen the past two days to the top of its descending wedge, and diverging from equities, is back down to the 75 area again, but now bouncing on the data. 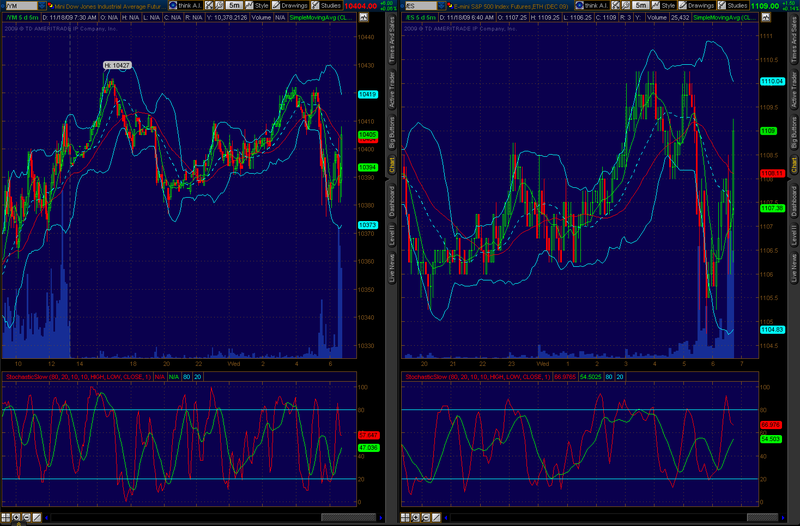 Bonds are flat but moved up strongly the past two days, again, diverging from equities. Both oil and gold are higher, both are now right on the upper trendline of their respective formations – that means they either turn here or break out higher, as in this morning – I vote turn down here, but we’ll see what Goldman’s computers say. The MBA Purchase Applications Index fell yet again following last week’s huge 11.7% plunge. This week it fell “only” 4.7%... what a disaster. The government's extension of buyer credits hasn't started a rush in the housing sector. MBA's purchase index sank steeply again, down 4.7 percent in the Nov. 13 week for what the report said is the worst reading since 1997. Refinance applications, which have been soaring, edged back 1.4 percent. Rates are at rock bottom, down 7 basis points in the week at an average 4.83 percent for 30-year loans. Housing starts will be posted at 8:30 a.m. ET. Housing activity unexpectedly fell back in October, calling into question the strength of housing recovery. Housing starts in October dropped 10.6 percent, following a revised 1.9 percent gain the month before. October's 0.529 million unit pace of new home groundbreaking came in much lower than the consensus forecast for 0.600 million unit and was down 30.7 percent on a year-ago basis. The decline was led by a 34.6 percent plunge in multifamily starts but the single-family component also slipped-by 6.8 percent. By region, the October drop in starts was led by an 18.8 percent fall in the Northeast. Other Census regions also declined: the Midwest, down 10.6 percent; the South, down 9.6; and the West, down 8.5 percent. Homebuilders appear to be cautious about upcoming new home sales as housing permits in October dropped 4.0 percent after dipping 0.9 percent the month before. October's pace of 0.552 million units annualized was down 24.3 percent on a year-ago basis. October's starts numbers were disappointing and likely reflect concern by homebuilders about the housing market once the first-time homebuyer tax credit was expected to expire at the end of November. That credit has been extended and expanded and we may see some pickup in coming months in the single-family component. Weakness in the multifamily component will still be affected by high vacancy rates but this component is volatile. On the release, equity futures slipped as Treasury yields mostly firmed (but as a result of higher CPI inflation announced at the same time). 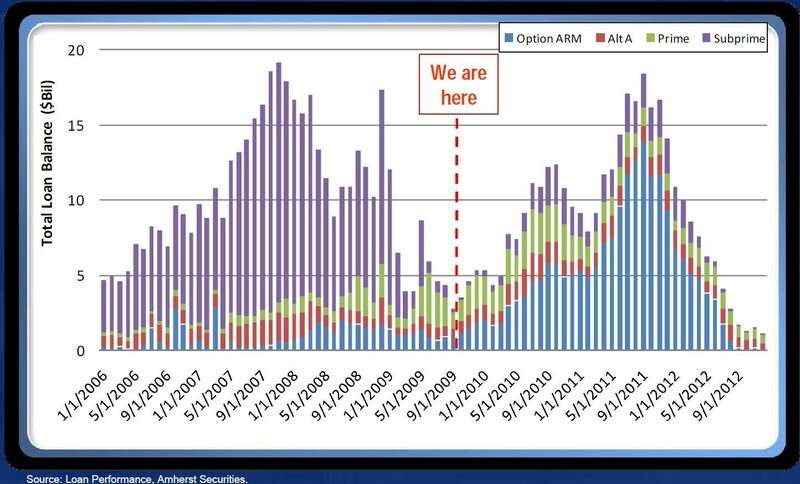 And speaking of housing, you know what’s worse than this chart showing that we have a whole ‘nother round of pain to come? 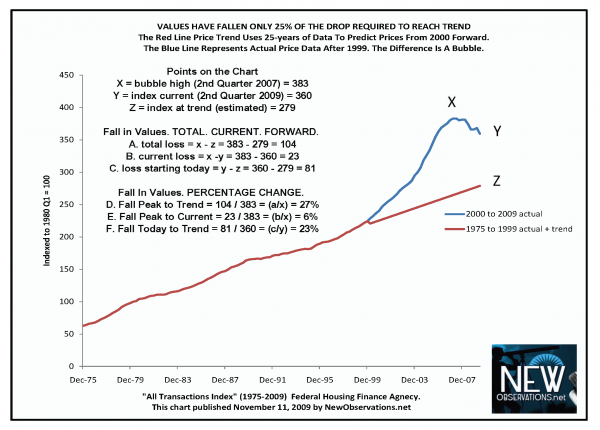 The total projected fall from the Federal Housing Finance Agency (FHFA) “All Transactions Index”, which begins in 1975, shows a peak-to-trend fall of 27%. 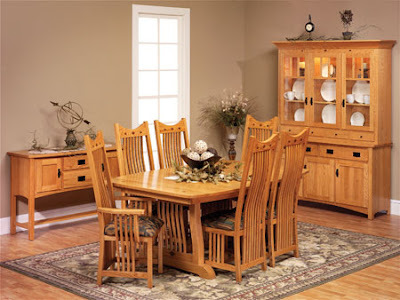 Since prices are 6% lower by this measure, prices must still fall an additional 23% from today for prices to revert to trend. 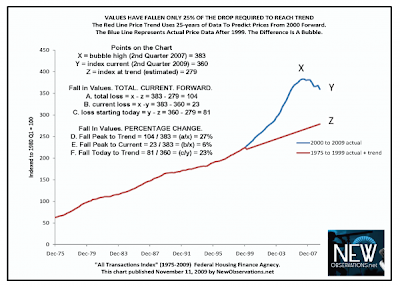 How do you think banks and the GSE’s fare if housing falls 3 more times as much as it has already? Of course that’s impossible in some areas, and their report shows only a 6% decrease which is obviously low compared to other studies, but the risk is still very much to the downside as many of the basic ratios are still out of whack on a national level – things like rents to ownership costs with standard financing. 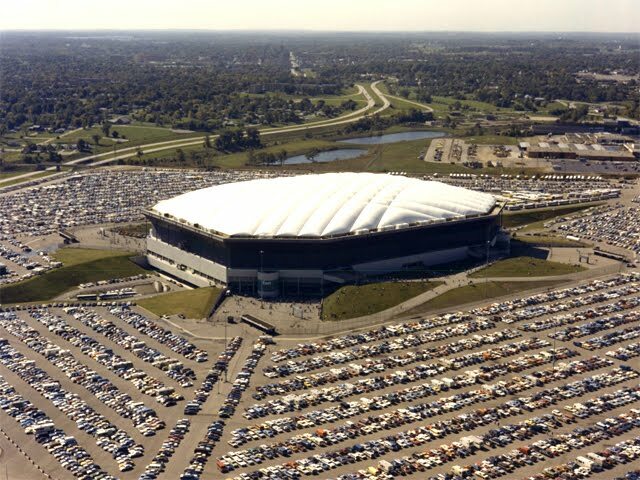 ...To walk into the huge structure that is the Silverdome can still take your breath away. With a seating capacity of 80,311, its still one of the largest in the world. 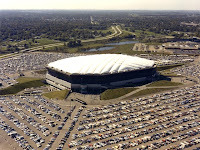 The Silverdome was home to the National Football League’s Detroit Lions, the National Basketball Association’s Detroit Pistons and the United States Football League’s Michigan Panthers. It has seen major events such as Super Bowl 16 and the 1994 FIFA World Cup. This stadium was built in 1975 at a cost of $55.7 million. Selling price? $583,000!!! That’s far less than the last home I owned. Is it a bargain? Do you have the money to replace the roof? How about to heat it and to otherwise maintain it? Reminds me completely of the fall of Rome. Here in Seattle, we tore down a perfectly good King dome before it was even paid for, the debt still hangs around. We built for more than $400 million (that’s nearly half a billion) Qwest field for the Seahawks who couldn’t share with the Seattle Mariners. The Mariners spent another half billion building theirs after the voters voted down helping to pay for it. How did they finance it? Government officials simply took lottery money (supposed to go to schools) and created new taxes, thus bypassing the will of the voters. By the way, I think it’s important to know how you are being manipulated… the Wikipedia entries on all of Seattle’s stadiums were obviously written by the team’s marketing departments. They fail to talk about these issues and put a positive spin on how the financing came about, also completely ignoring issues like the Mariners $100 million cost overrun and the fact that it’s STILL in the courts trying to decide who is responsible to pay for it. But that’s not all we have in Seattle, oh no. We have the Key Arena that used to house the now defunct Seattle Sonics. True, it is aging, but it was renovated in 1995 costing the city of Seattle more than $75 million. Then there’s the University of Washington’s Husky Stadium, a huge open air stadium on Lake Washington. The school wants to renovate and expand in a project costing another $300 million. Fortunately, they are currently having trouble getting the funds, but are still trying. I hope they fail, and I hope they concentrate on what schools are all about. This sports team mania is way out of control, far beyond what is proper for society, a huge misallocation of resources. Consumer price inflation was warmer than expected. Headline consumer price inflation firmed to a 0.3 percent boost after rising 0.2 percent the month before. The market had forecast a 0.2 percent gain. Core CPI inflation was unchanged with a 0.2 percent increase and was above consensus expectations for a 0.1 percent rise. But some of core strength appears to be temporary. First, boosting the headline number was a 1.5 percent jump in energy prices after a 0.6 percent rise in September. Gasoline was up 1.6 percent, following a 1.0 percent increase. Food price inflation was restrained in October with a 0.1 percent rise, following a 0.1 percent dip the month before. The core rate was driven up by vehicle prices for the most part. According to the BLS, the indexes for used cars and trucks and for new vehicles both rose sharply and together they accounted for over 90 percent of the increase in the index for all items less food and energy. The index for new & used vehicles jumped 1.7 percent after a 0.5 percent rise in September. The indexes for airline fares and medical care also increased, by 1.7 percent and 0.4 percent, respectively. Indicating softness in the underlying trend for the core, the shelter index was unchanged and the indexes for apparel and recreation declined. Year-on-year, headline inflation increased to minus 0.2 percent (seasonally adjusted) from down 1.3 percent in September. The core rate was firmed to up 1.7 percent in October from up 1.5 percent in September. On an unadjusted year-ago basis, the headline number was down 0.2 percent in October while the core was up 1.7 percent. Overall, inflation outside of energy likely is not accelerating but neither is it as subdued as the Fed probably prefers. Treasury yields generally firmed on the news despite lower housing starts announced at the same time. I still view this number as pretty tame month over month, especially considering the increase in energy over the past 8 months. Should energy fall back down CPI and PPI are going to descend rapidy. Yesterdays extremely low volume ramp contained several short term divergences in addition to creating several small hammers that are potential signs of reversal (need confirmation). The divergences yesterday included; the percent of stocks over the 5dma diverged bearishly downwards, decliners outnumbered advancers, the McClelland Oscillator fell, and the number of new highs fell sharply. 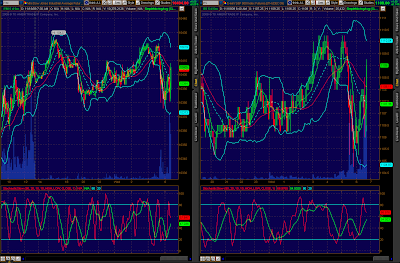 These, and the action of the dollar and bonds is screaming for a top. Yet, price just doesn’t want to give in. Could it be that the “investment banks” with their computers are such a large percentage of the market that they have created an entirely artificial market? Have all the real owners sold already and now it’s largely just the banks, quants, and hedge funds swapping electrons? Hmmm… it’s true that the sellers have not come out in enough force to swamp and to overwhelm their games. I still believe that’s coming. Some will say that TA no longer works and that they are, in fact, turning TA against real people in order to steal their money. That may very well be partially true. That’s one of the reasons that I am not playing in their casino right now. 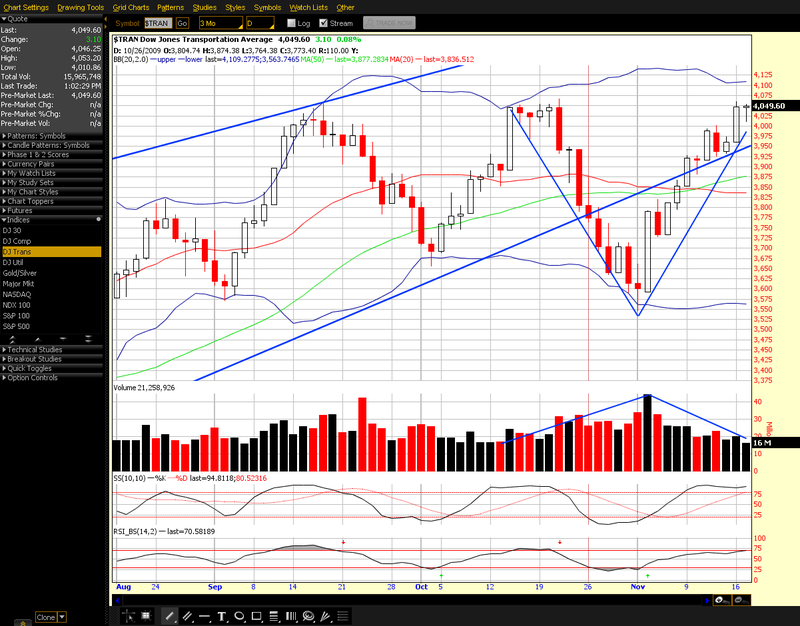 Take a look at the volume pattern on the chart of the Transports below over the last sell off and the current ramp. Where’s the volume? That’s a classic sign, ignore at your own peril. Several technicians are calling that closing high DOW theory reconfirmation of a buy signal, and yet it did not make a new intraday high, only a closing high. The other very large divergences are still in place, I strongly urge everyone to consider just how risk filled this paper and electronic ramp job is. To be bearish is one thing, but if there’s anything I’ve learned over the years, it’s that you do not have to be in the market all the time! I’ve been completely on the sidelines and still am. Why fight a trend, wait for it to break – it will. The market is crazy, the bankers and the idiots running our government are literally insane. You know the saying is “don’t fight the Fed.” But the truth is that the Fed is not omnipotent, they are the crazy ones, they are fighting a losing battle against exponential math. The math is going to win, it’s even going to win against manipulations and computers, debt is the wall.